Whoa! I’ve been gone for a good long while, eh? Things have been crazy since my husband quit his job to work for me. I had 2 work trips and our whole house got hit with the flu. So, if you’ve been wondering where I’ve been, that’s the answer. Now that we are all back in good health I’m ready to launch a new video tutorial! It’s been a while, I know. It’s a lot to handle when you’re a one woman show. With Easter around the corner I thought you would enjoy a fun and easy beginner sewing project that is sure to make you the star of the party! This is scrap friendly and would be great for a child’s easter basket, a gift basket or even a cute organizer for your sewing room or bathroom. Check out the easter baskets Quilt Club member, Diane L. made! These are just too cute! I like to use mine to store my sewing supplies. They are so handy and you can never have too many beautiful fabrics to look at in your workspace, right?! 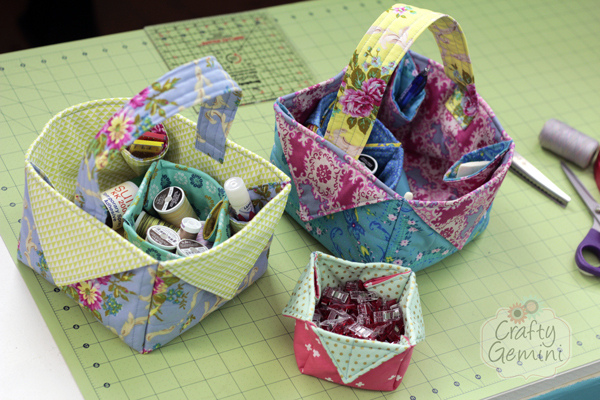 I’m sure you will find a million and one uses for these fun fabric boxes/baskets! The fabrics I used in this video tutorial are from Caravelle Arcade by Jennifer Paganelli for FreeSpirit Fabrics. You can check out her blog here. She designs some beautiful fabrics! 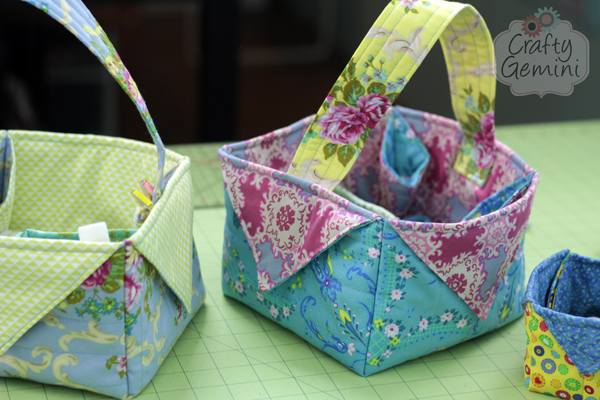 The finished basket I teach you how to make in this video tutorial measures roughly 7″ x 7″ x 5″. Heads up! If you want to make the cute little boxes you see in my pictures you can create them the exact same way as in the video except you start off with two squares of fabric that measure 10″ x 10″ and for your corner measurements use only 2″. Leave off the handle and that’s it! I love to store my wonder clips in my little box. You can make these in all different sizes by playing around with your dimensions. So, have fun! • One square of outer fabric that measures 18″ x 18″. • One piece of batting slightly larger than your outer fabric. • One square of lining fabric that measures 18″ x 18″. • Basic sewing supplies: rotary cutter + mat, pins, ironing board + iron, scissors, etc. Now I’ll leave you with the video tutorial! Hope you enjoy it and get a chance to whip some up this week either for yourself or as Easter baskets for your loved ones. Happy sewing! Why my husband quit his job today. Thanks so much – answers my questions! Very cute baskets! I see lots of baskets in my future. Thanks again for your tutorials! Great job. I want to try this for my granddaughter. If I get it done I will post pictures. Great tutorial and easy to follow each step. Thanks so much for sharing your ideas. I’ve seen the pattern to make baskets like these for sale but was going to try to figure out how to do it myself – you’ve saved me the time and trouble of doing that. I will definitely be making a lot of these cute baskets for gifts (and some for myself!). Thanks for posting this just in time to whip up some for the grandkids. I made the box without handles for my sister for one of her birthday gifts (and a zip pouch, too) and she loves it. Sorry, I don’t need spam !!! I won’t be back nor will I suggest your site to anyone !! PS – Now I have to spend the time removing all these spam links from my control panel. Not sure what download links and spam installers you are referring to. But I do not offer any download links directly from my website. The only way to receive some of the PDF patterns that I do offer for free is to enter your email address on the page provided and then have the file emailed directly to you. You never download directly from my website. So, I’m not sure where you are accessing those links from. My specialty is in video instruction so, I don’t normally offer downloadable instructions with my free video tutorials. I normally don’t comment on anything! However that really made me mad!!! She is obviously unskilled and doesn’t have a clue as to how your tutorials, or site work!! That was so mean (B. A. LILLIS) If she doesn’t visit you, it’s her loss. You are an amazing teacher. I’ve learned so much from you, as so many thousands have. That SNARKY COMMENT, was totally uncalled for, when she was the one who made the error!!! Please don’t listen to people who are not worth listening too. I agree. It is there lose. You have wonderful tutorials. I really do not understand some people. I think they wake up in the morning and going looking around on site just to see what they can complain about. WOW. Please help us all. Keep up the good work and love every thing you do. Thank you Vanessa for your instruction tutorials!! I love your website and all your tutorials. They are very helpful. I am sorry for the negative comments you have received. I have never had a problem with any spam etc. Please continue instructing. It is sad that people can be so unhappy and just pass that on to others. God bless!! Love your tutorials!! I haven’t had any problems here with spam or anything of that nature! I can’t wait to see more tutorials! Super easy to understand! Thank you for sharing with us! Just wanted to send a quick note to mention how nice it was to meet you in Austin. I have enjoyed watching you grow and evolve. Plus it is nice to have met you in person (feels more personal). I wanted to wish you all the best with your husband joining the Gemini team! I still smile when I am reminiscing about that trip—and you mentioning the live stock arrival coming that weekend. Sending all my Best! Hi Vanessa, I’d like to ask you to take part in my research that I’m doing for my Master’s thesis. It’s about what influences the relationship between YouTube Stars and their subscribers. There are only 7 questions and it shouldn’t take you more than 10 minutes. This is the link to the research form: http://goo.gl/forms/tTwUZJ2Ev7 but if you like, I can send you the questions to your e-mail. Girl, you just plain rock! Thank you so much. Love these baskets! Perfect for Easter or any gift giving occasion, as well as for storage. You always make it look so easy, Vanessa! Can you please tell me what size you cut the fabric for the smaller basket? I think the basket you are talking about started with 10″ squares and had a 2″ triangle on the corners. Vanessa will probably chime in eventually. Have you jointed her quilt club? It is such a blast and she gives us lots of chances to communicate. There is also a Crafty Gemini Crafters page on Facebook where all of us give each other tips and answers to questions like yours. Hope that helps. I loved the baskets and can’t wait to make some. I was wondering what iron you wren using in the video. Is it a travel iron? Also it looked like you were using it without the cord. I am looking for a small iron to use next to my sewing machine as you were doing. Is it possible to give the name of the iron and where I might purchase one? Hi Vickie! Glad you enjoyed the tutorial. The iron is not actually a travel iron but I guess it could be! It is a cordless iron that has a point on both ends. It was a Christmas gift to myself and I love it so far! This is where I got it from: http://amzn.to/1F3LMF0 Hope that helps! Have you checked out the Crafty Gemini Crafters on Facebook? A lot of the products that Vanessa uses are in a file that is on that page, up at the top somewhere. Hope you can find it. I am a member of the CG Quilt Club. How do I find the Crafty Gemini Crafters on Facebook. I tried putting that into the search engine but nothing came up. I also made Easter baskets (without handles) this weekend and took a picture! I did it a little differently, in that I quilted all layers together and then bound the edges like a mini quilt before sewing into the basket shape. Thanks so much for the tutorial. First time here, but I’ll be back! Thank you for the extra little twist on this wonderful video! I believe I will try this. thank you for taking the time to make these video tutorials. I am a visual learner. And this far out does the original tutorial by leaps and bounds. I don’t like many of the sewing tutorials out there because they lack step by step pictures and just assume people that sew will understand. Pictures are worth a thousand words and videos even more. Thank you for such a great video. I can’t wait to try one of the baskets. Hi Vanessa,It’s me again Carolyn Cook.You brought tears to my eyes.To hear your story is unbelievable.If you look at you on the videos.It seems like your life has always been great.You have such a drive for life.You love your kids ,you love your husband.I ADORE you so much.The story was happy,sad,joyful,and uplifting.One thing you still need to do.Is think about writing a book.You can do it,because.y’all did. Wonderful tutorial, I made one tonight and it was so easy, thank you. In my classroom we use bucket filling, (the idea comes from the book ‘How Full is Your Bucket for Children’) and I wanted a cute ‘bucket’ for the students to put their bucket fillers in (bucket fillers are complements that they received from other adults on campus: substitute teacher, aides, administrator, bus driver, etc.). They have their own little tin buckets that they get to fill up, as I notice them demonstrating positive qualities. Needless to say, I made your smaller size basket and I am going to use it next week when school starts, thanks again! Vanessa, WOW!! thought your tutorial about the round reversible basket was great..then I found this one…WOW!! I just have to make this one as well. These will make great gifts! Anymore ideas coming? Love your tutorials. You do wonderful on showing us step by step process! So easy to follow! If I wanted do some larger/smaller baskets . . . How do you figure the size of the comers to sew? Is there a graph to follow with corner size per basket size? Thank you , I love your tutorial , you show us step by step. Am a beginner to sewing. I made 10 box’s for my grandson birthday party. This is so cute. I’m picking up my new sewing machine tomorrow. I’m so excited. My machine will do all sorts of neat things that I can use to embellish the basket/box with. Thank you so much. I live in Oregon near the coast. Do you ever get out this way? I came across your site by accident. It was a very happy accident. I love your site. Your videos are very clear and easy to follow. Looking forward to more projects. Thank you! LOVE it …guess what I’m doing this weekend!!! Making baskets! Love your tutorials! You take the fear out of trying something new! Love this little basket. So pretty and easy to make. Your video is clear and easy to follow. 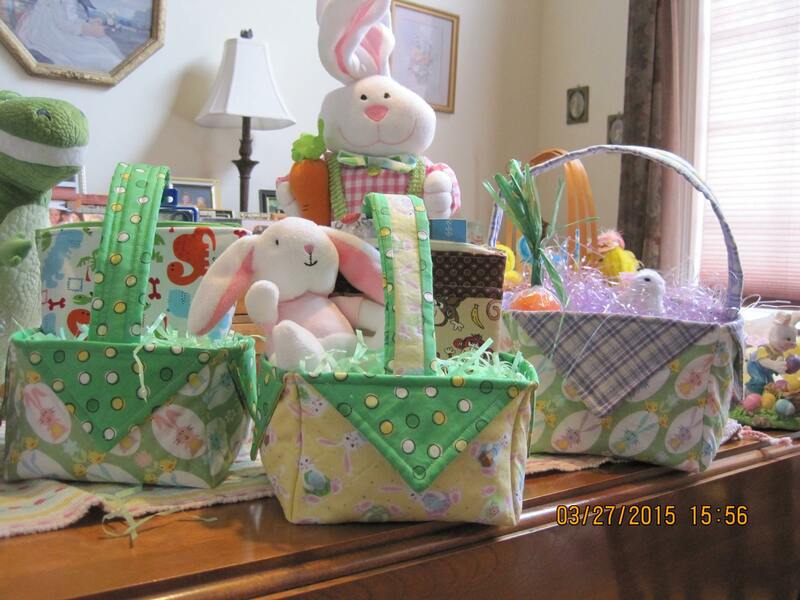 I have lots of Jennifer Pagganelli’s fabrics and will try to make a few of these baskets for Easter! Great video Vanessa. You are an excellent instructor. Direct and to the point. Enjoyed this very much. Hi Vanessa, your tutorials are fantastic. Thank you so much for sharing. So easy to follow for a beginner like me who is just starting out crafting. Please could you tell me the size of square you used for the little basket you keep your clips in. So glad I found you channel. Love the video and even as an experienced sewist I love how detailed you get and the repetition so we don’t mess up! 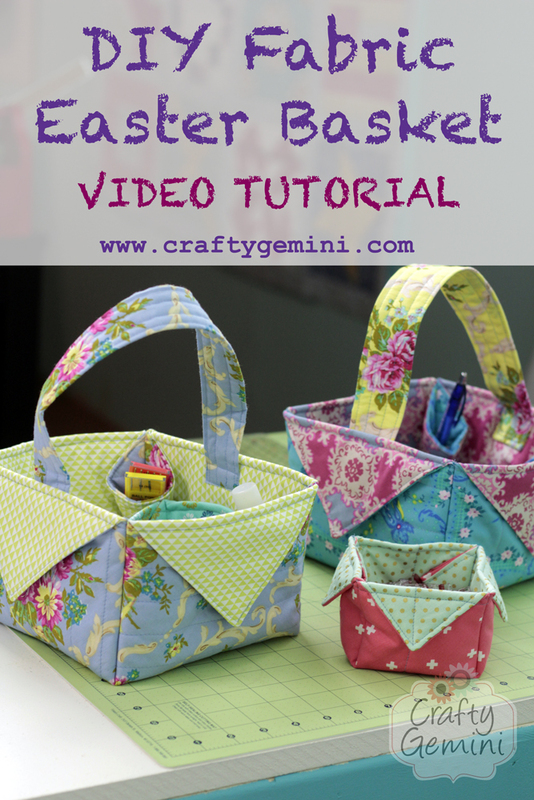 I will be watching more of your videos and plan to make lots of Easter baskets this year! I love the baskets!! I’m new to sewing and your viedo was wonderful. Your videos are great. Very easy to follow and understand!!! Thanks! Keep up the good work!